Why is your child avoiding school? Up to 35 percent of school-age children display school-resistant behaviors, which can range from temporary/short-term reluctance to continual avoidance and refusal to go to school. If your child continually begs to stay home or be home schooled, visits the school nurse with vague complaints or asks to be picked up early from school, he/she may be avoiding school. 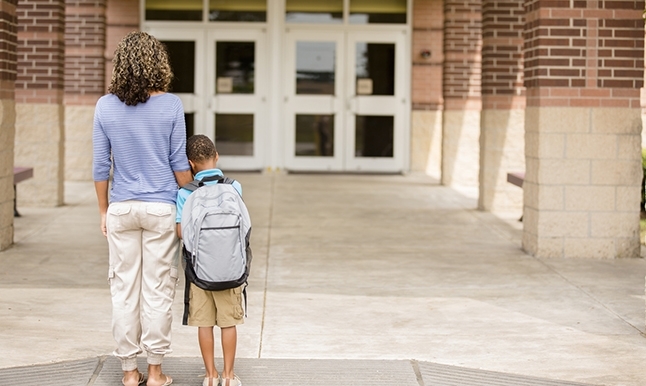 If not addressed, school avoidance can turn into school refusal, a more serious behavioral issue characterized by extended avoidance, refusal to attend or stay in school, distress or social and academic impairment. Extended school avoidance or refusal can lead to serious consequences such as family conflict and stress, difficulty maintaining peer relationships and problems with academic success in adulthood. Parents should start by speaking to their child’s teacher to find out if there are specific issues at school that could be causing them anxiety, such as bullying, learning issues or being behind on course work. If the problem is significantly affecting their child’s life, parents should seek a diagnostic assessment with a mental health provider who specializes in pediatric anxiety and behavioral avoidance. In serious cases of school refusal, cognitive behavioral therapy is the most common intervention. Treatment usually includes close collaboration with the school, and in some cases, an individualized education plan. Read more Health Tips for Parents at uclahealth.org/HealthTips. Tags: Anxiety, bullying, Children’s Health, health tips, Healthy Living, isolation, school stress, school-related anxiety, social anxiety, Wellness, why is your child avoiding school?